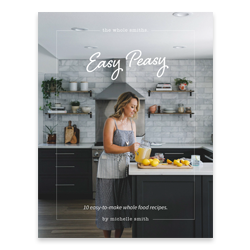 In collaboration with The New Primal, The Whole Smiths has created not one but four unstoppable healthy recipes to enjoy during your football game. 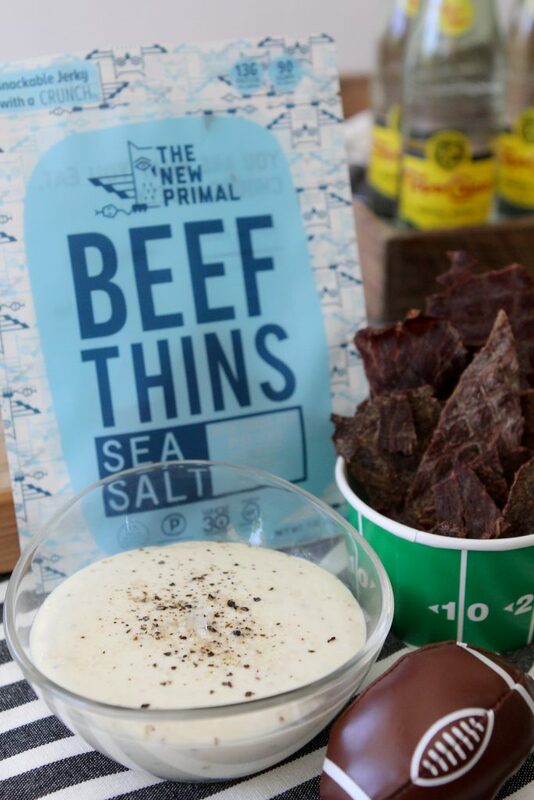 First on the field are two dips, a paleo Horseradish + Black Pepper Dip and Chimichurri Guacamole to dip your Beef Thins into. Followed up with a BBQ Chicken Meatball and Chicken Tender Buffalo Dippers for the win. Game on! I can’t seem to decide what exactly it is that I like most about football season. The actual football game, yes, of course. (Go Niners!) But I can’t help but wonder if the cozy fall and winter weather doesn’t lend to my appreciation of football season. Staying in cozy, watching football, and being lazy while the weather outside is turning brisk? I love it. Add some killer food options to that picture and now we’re talking. One thing that kills me about football eats (or any social function with food) is that it usually tends to be junk food centric. Don’t get me wrong, I’m always down for some good ‘ol fashioned chips and dip here and there, but on a regular basis? I can’t. 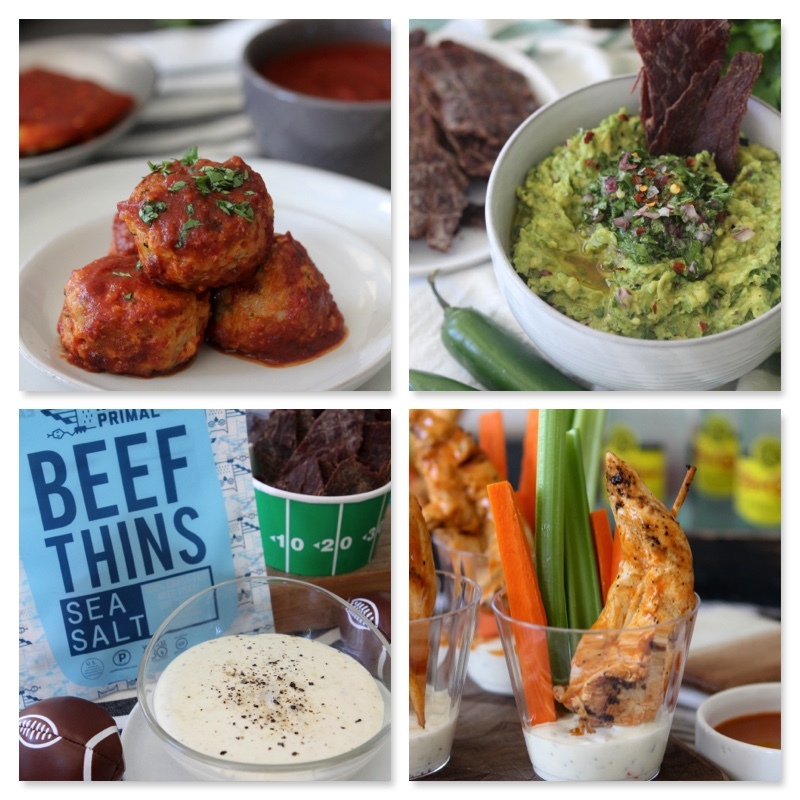 So when I had the opportunity to work with one of my favorite companies, The New Primal, to re-imagine football eats into a healthy spread we can indulge in, I was game. We teamed up with friends at Whole Foods Market and Topo Chico to complete the football eats experience from start to finish. 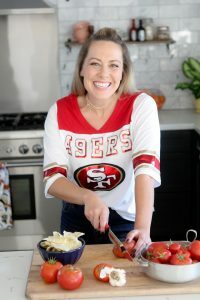 Together we created four different dishes that you can easily whip up and serve to friends and family during your football watching festivities. 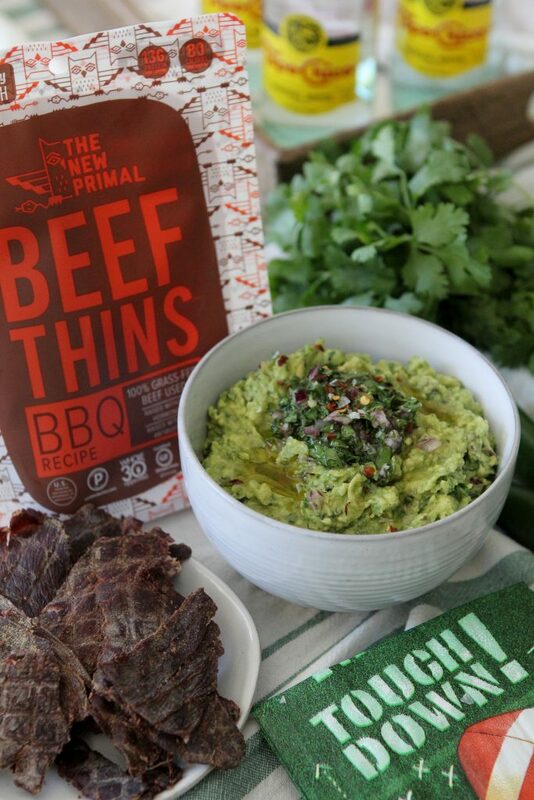 From two dips that pair perfectly with The New Primal’s Beef Thins to some small bites using their new delicious Whole30 complaint sauces, I can promise no one will go hungry come game day. Finish that all down with an icy cold, fizzy Topo Chico and it won’t even matter if your team loses. Ok, maybe it’ll just make it hurt a little less. The first two recipes I created are to intended to replace old fashioned chips and dip. Potato or corn chips are often loaded with unsavory ingredients, less than stellar oils and can be a carb overkill. The problem though is that I love dipping things. I’m such a dipper. So much so that you’d think I was an 8 year old child. If I can dip it, I’ll eat it. 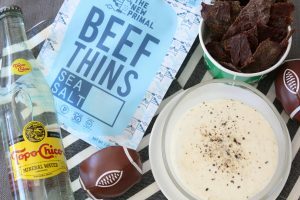 While we can always use vegetables as a dipping vehicle why not add some extra protein and use The New Primal’s Beef Thins to dip into our favorite dips instead? 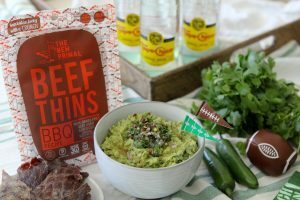 The dips I created are meant to perfectly compliment the taste of the Beef Thins; a Horseradish Cracked Pepper Dip and a Chimichurri Guacamole. As we all know horseradish and chimichurri always pair perfectly with beef. It’s a match made in foodie heaven. Feel free to pair either dip with the BBQ or Sea Salt variety of Beef Thins. I made sure to taste test them either way and they’re both delicious. In fact, I ate as much as I could of both, to double and even triple check that everything was just perfect. Ok, fine. Maybe all of that testing was more for me than you. Scroll down for both delicious recipes. 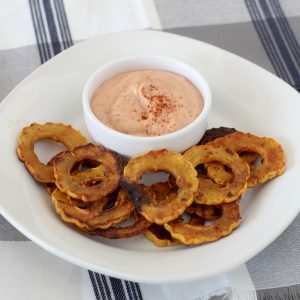 Outside of dipping, small bites are where it’s at for homegating needs. Something you can nibble on throughout the game or something to nosh on during commercial breaks. For some reason, a giant burger doesn’t seem to make the cut. You want something to last throughout the game, right? I mean, I guess I can just nibble on the same burger for hours on end but that seems like a bad idea. Instead, little bits of food that you can feel good about is the solution. 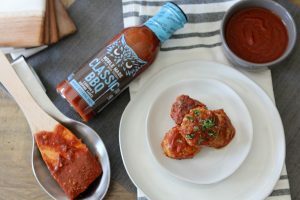 I love using The New Primal’s BBQ Sauce with my BBQ Chicken Meatballs from The Whole Smiths Good Food Cookbook. And guess what? 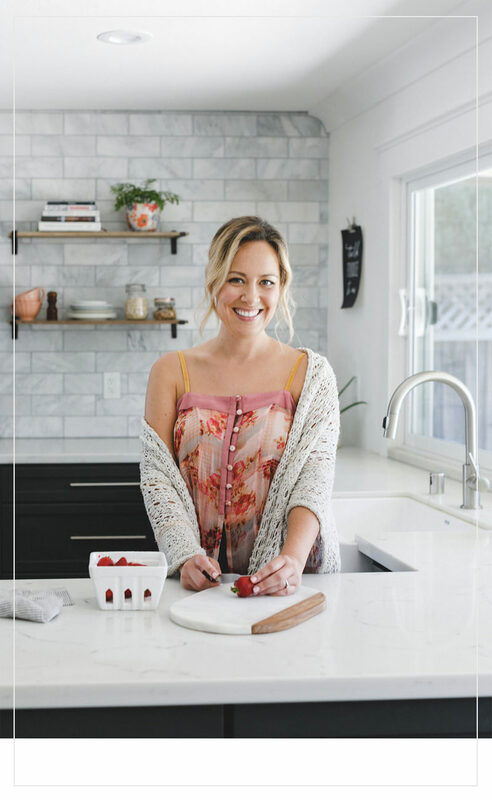 I’m sharing that recipe here with you today. Scroll down through to grab it. I don’t care whether you’re 6 or 60 these meatballs are where it’s AT. I used crushed pork rinds in lieu of breadcrumbs to give the meatballs the perfect texture and as an added bonus, extra flavor. 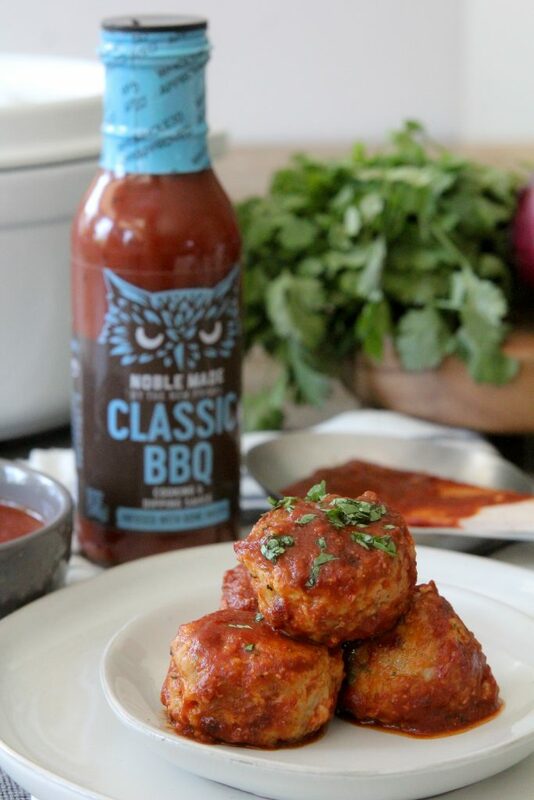 The tanginess of The New Primal BBQ sauce pairs so well against the smokiness of the meatball. Whip a batch of these up pre-game, throw them into a slow cooker on low to simmer and keep warm through the game and enjoy! Go Buffalo! Not the team, the sauce. For your final recipe, I made the tastiest, most portable, well-balanced football snack for you. Healthy fats? Check. Protein? Check. Veggies? You know it. All of those are combined into my Buffalo Chicken Tender Dippers. While I prefer to grill up my chicken tenderloins you can also feel free to cook them under your broiler if necessary. I understand that some of our grills may be packed up out of the snow during football season and not everyone has year around grilling weather like we do in California. But if you have access to a grill, that smoky flavor is aways a good idea. 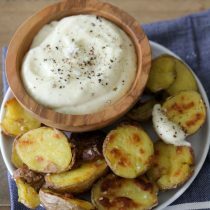 If you’re looking for a particularly clean ranch dressing to use in this recipe, might I suggest my Bacon Ranch Dressing? If you aren’t fond of the “bacon” portion feel free to just omit it for a regular ‘ol, delicious, life changing ranch. I didn’t oversell that did I? It’s even better paired up against The New Primal’s Buffalo Sauce. 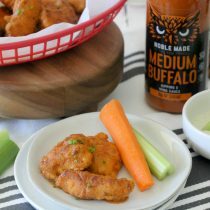 I usually use the Medium variety of the buffalo sauce as it’s suitable for both my husband and I and the kiddos. A kick but not too spicy that the kids will complain. 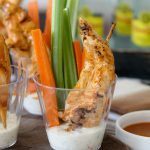 Throw it all into a small cup with some veggies and it’s perfect for nibbling on during the game, dip and dippers all in one! Without further delay, here are your new favorite football-ing recipes. 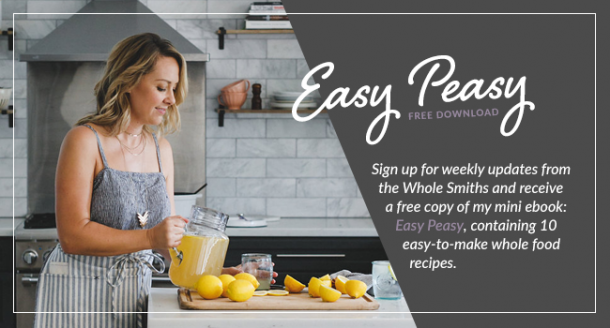 Make sure you head to your local Whole Foods Market this season to stock up on all things The New Primal. And don’t forget the Topo Chico to wash it all down with! 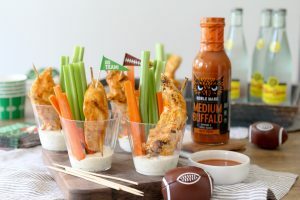 These Buffalo Chicken Tender Dippers From The Whole Smiths are the PERFECT game day eat. Paleo & gluten-free. Preheat your grill over high heat. Salt your chicken tenders and add them to a large bowl. Pour 1/3 of the New Primal Buffalo Sauce over the chicken and stir to coat. Skewer the chicken tenders onto 6 inch wooden skewers (cut yours down to make them shorter if necessary). Add the skewers to the grill and grill on each side for 5-6 minutes. Brush additional buffalo sauce over top before removing them from the grill. Remove the sewers from the grill and let them rest for 5 minutes. Add roughly 1 tablespoon of the ranch dressing into the bottom of a small cup. Add 2-3 carrot sticks, 2-3 sticks of celery to the cup along with one chicken skewer. 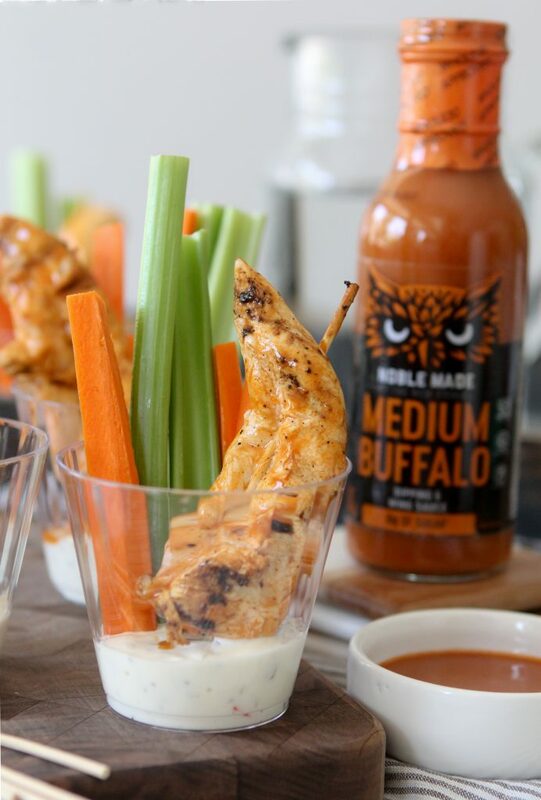 Pour the remaining buffalo sauce into a bowl for extra dipping and serve. Those are the perfect snacks to watch a football game.